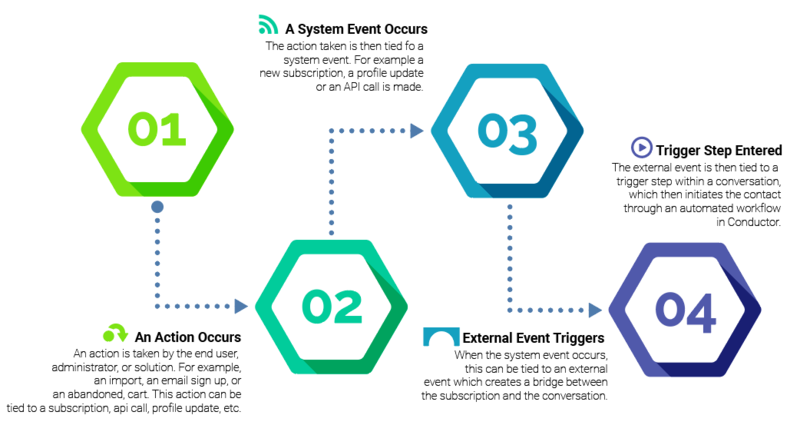 Learn more about external events and their use cases. Listrak Conductor is an automation workflow engine that allows you to deliver messaging to your customers at the right stage of the customer journey in the right channel. Triggers and events bridge a contact from a taken action to entering a conductor workflow. This is what ties an action to the entrance of a conversation. For example, if you have a Welcome Series conversation, with multiple different entry points (ex: popup), and a contact provides their email address within your popup, they’ve completed an action which triggers an external event that bridges the contact from the popup subscription to the conversation, allowing the conversation to begin for this customer at this entry point. They are then sent to the appropriate step within a workflow. An external event is a way to represent any action a contact has taken. For example, when someone leaves items in their online shopping cart, you can configure an external event (such as Abandoned Cart), and subscribe all contacts who left items in their cart while triggering the Abandoned Cart event. This triggers associated individuals into the external event, ultimately moving through the rest of the configured workflow. A list event is a generic option that lets a subscriber enter a workflow when a change is made to your list. Examples of a list event may be profile data updates or changes of address. 4. Click New Event Group. NOTE: Add an Event Group to categorize and organize your external events. 5. Enter a name for the Event Group. For example, Welcome Series or Abandonment. 6. Click Create Event Group. 8. Enter an actionable name. For example, a popup sign up. NOTE: The external events are typically named after the action/event that's taking place. 9. From the group drop-down menu, select the new event group that you previously created. View external events and groups under the Authoring menu. The next step is to tie an event to a conversation that's built in Listrak Conductor. Adding an event to the conversation allows the conversation to become active, ultimately allowing contacts to begin fulfilling those actions.